Will Gavin's Law, Honoring Killed Educator, Clear First Hurdle? If Andrew Janz wants to pull off the political upset the nation talks about for months, he needs to do one thing — and one thing only — before the Nov. 6 election. Talk to Republicans in CA-22. Janz and President Trump (what a combo!) have already energized Democrats in Rep. Devin Nunes’ district. It’s virtually guaranteed that Democrats will run to the ballot box to send the Fresno County prosecutor to Congress and thumb their noses at the president. But that won’t be enough to retire Nunes from the House of Representatives after eight terms. Not even close. The district is a Republican stronghold, and no party preference voters (what used to be called “independents”) long have supported Nunes by a large margin. Staunch Republicans, of course, will stick with Nunes. One, he’s their guy. Someone they can count on to challenge liberals, ridicule environmentalist and defend Trump. 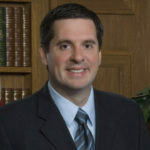 Two, there’s an “R” next to Nunes’ name. Old habits die hard, if they die at all. But there are also Republicans who might be convinced to roll the dice on someone from the other party. Janz needs to get Republicans who are open to a change talking about him as a viable option. If he can win their trust, they will influence others. The impossible becomes possible. These include Republicans who are embarrassed by Trump’s antics — the polls suggest they are plenty of them right now. They could be farmers (along with their employees) who take stock and calculate that for all of Nunes’ foot-stomping and yelling, he hasn’t really delivered for them. Or they could be business owners who remember Nunes as the free-trade warrior who once hated tariffs but now genuflects to Trump while the president ignites international trade wars in which everybody loses. To win over these Republicans and conservative-leaning independents, Janz must demonstrate that he doesn’t bite, he’s not a loony tunes liberal and he won’t disappear into the DC swamp. This kind of convincing can’t be accomplished with slick, poll-designed television ads. It requires shaking hands, looking people squarely in the eyes and answering tough questions. The experts, of course, say that you can’t win a congressional seat this way: The area is too big and there are too many voters. There’s some truth to that. But Janz needs to get Republicans who are open to a change talking about him as a viable option. If he can win their trust, they will influence others. The impossible becomes possible. It helps Janz that Nunes is virtually invisible in the district — other than campaign commercials and chats with his radio buddy Ray Appleton. Nunes’ absence can be explained by this: He believes the folks back home will to take care of him, just as they always have. This no simple election for Nunes. He’s doing everything humanly possible to keep Republicans in control of the House while gambling he can swat down the Democratic pest in his district with minimal effort. In addition, Nunes has bigger fish to fry. He is pouring his heart and soul into Republicans holding their House majority. If Democrats take control, he loses the chairmanship of the House Intelligence Committee and the power of being in the ruling party. This is why he’s flying all over the country and holding private fundraisers for GOP candidates. This is why he’s running ads whipping up support to repeal California’s gas-tax hike. Thus, this no simple election for Nunes. He’s doing everything humanly possible to keep Republicans in control of the House while gambling he can swat down the Democratic pest in his district with minimal effort. For Janz to win, the path to victory should be clear. No more MSNBC. Not even if Lawrence O’Donnell calls. No more tweets ridiculing Nunes. In their place: a 100% focus on winning over Republicans. Tonight, he’s at the Tulare County Fair. The 22nd Congressional District race between incumbent Devin Nunes and Fresno County prosecutor Andrew Janz is heating up. Campaign signs of support have been springing up all summer long. The question of what Mr. Nunes has accomplished for the economic health of CA 22 goes unanswered. However his office did state that his efforts to improve air quality included his vote for HR 806 (not taken up by the Senate) to study ozone formation, proposed regulations and other related matters which have been well reviewed in the almost 50 years since the Clean Air Act of 1970. Of note is Mr Nunes’ willingness to recently visit the President of Azerbaijan in Azerbaijan, a country in the path of a natural gas pipeline which would service powerful foreign interests(and perhaps one or a few individuals). Did our representative involve himself himself in a foreign economic development while 22nd District needs go unanswered? Do you wonder whose interests Mr. Nunes really cares for? I do. Mr. McEwen, I disagree with your assessment of the pathway to victory for Andrew Janz. The path is narrow but I do not believe pandering to Republicans at this stage of the race will improve his chances of winning in November, 2018. First, since the beginning of his campaign Andrew Janz has been out talking to any Republican farmers and Republican business people that would listen to him. I agree that locally there is a small percentage (maybe 10%) of Republicans who as you say, “are open to change” and might consider Janz, “a viable option,” but they probably have already been peeled off, and by this time have decided to vote for Janz based on his integrity, honesty, ethical stances and current positions on the issues. It has been clearly demonstrated that those local Republicans who continue to support trump and Nunes are not going to change their vote regardless of what Janz says or does because they support trump and Nunes despite what they do or say. Nationwide the number is about 85% of Republicans still support trump, and thereby support his number one defender Nunes. That percentage probably applies locally also. 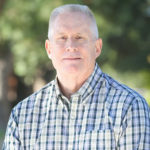 Those local Republican voters who might consider Janz have probably already made up their minds about trump’s policies, and no longer support Nunes, because of the fact that Nunes “hasn’t really delivered for them” and besides not campaigning in CD22, has remained silent on important issues such as water, immigration and tariffs. Given the high percentage of Republicans in Congressional District 22, getting 10% of Republicans to vote for Janz will not by itself win the election. To win Janz will need those 10% Republicans who are willing to break ranks, but will also needs a higher Democratic voter turnout than in the past. In particular, a high percentage of Latinos and young people will need to come out and vote for Janz in order to win. Since the 20% of voters who are in the “No Party Preference” group generally reflects and votes in the same percentages as the general population the above also applies to them. I never suggested he should pander. 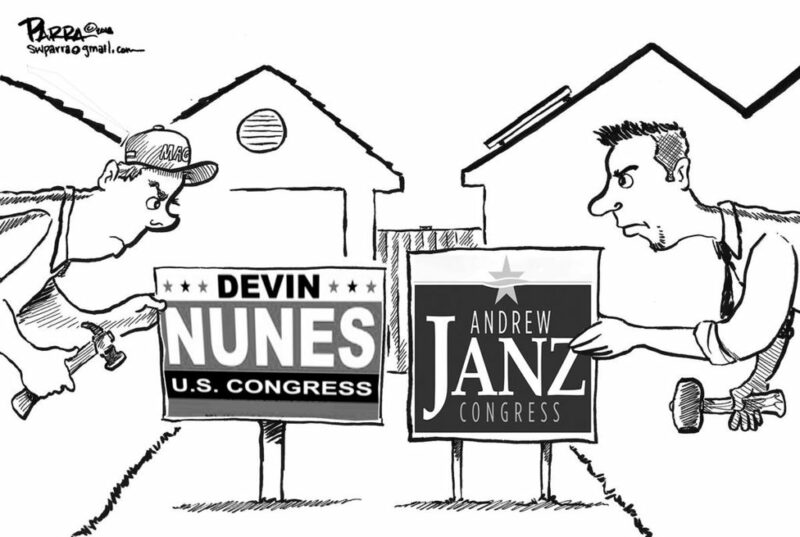 And any GOP votes that Janz attracts is one more vote for him and one less vote for Nunes. Janz’ path to victory requires energized Dems, which he has, winning about 60% of NPPs and convincing as many Republicans as possible that a conservative Democrat will serve their interests better. As acknowledged in the piece, it’s a tall order. Janz could be the resurrection of Thomas Jefferson and he wouldn’t get my vote if he had a D next to his name. The party is corrupt. Is driving Ca to ruin and is a party lead by progressive Marxists. Eventually he would toe the line like all mindless democrats do and vote to strip more and more of our liberty. Interesting assessment for the Janz campaign. I think Janz has held more public Town Halls and Meet and Greets throughout the District than any other Congressional candidate I have known. This includes Republican hosts like retired Tulare County Judge Howard Broadman who was a solid Nunes supporter until this year and he has strongly endorsed Janz. Janz is an amazing candidate as his support among Democrats, Independents, and Republicans continues to grow. More and more Nunes voters are realizing what an ineffective representative he is. Nice to know he helped ONE constituent with the VA. I wonder how long ago the couple contacted his Clovis office, which appears to be open only by appointment, assuming you can get a hold of someone on the phone. I find it amazing that you along with all right wing media continue to avoid the 800 pound elephant in the room. The fact that Nunes has chosen to protect a completely immoral and miserable human being like trump is reason enough to vote against him. The harm that trump has done to our country may never be completely rectified. And tRumps many racist, self serving, misogynist actions are in the media every day for all to see. That should be reason enough for any true patriot to vote against Nunes.